Increase self esteem, protects from negative energy, open the mind to new thoughts and promotes clarity. Calms and soothes distressed conditions. Overcomes depression, digestive problems, supports stomach, spleen and pancreas. The prime CASH, wealth stone. This unique stone has an amazing color, the smokey phamtom growth within the crystal makes the citrine a "neon green/yellow", mezmerizing. 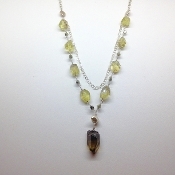 Natural Smokey Lime Phamtom Citrine on 925 silver with lobster claw clasp, 27 inch length plus center crystal drop from 1.75".